My first layout share from the Dag. I was very productive over the weekend and came home with a pile of layouts to share. I had a great time playing with my mists. I haven't had a chance to use them a lot at home so it was an opportunity too good to miss. I loved the great colours in these Bo Bunny papers and the circle patterns were just crying to be cut out and layered. 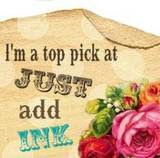 I have used my Stampin' Up! border punches too (Scallop Edge and Scallop Trim). I went to camp with a massive box of punches and used just about very one of them. Okay, I have heaps more to share over the next few days.